I thought I would make a template of this project available for you to download. I’m using Dropbox and I’m relatively new to it so I hope it works as desired. 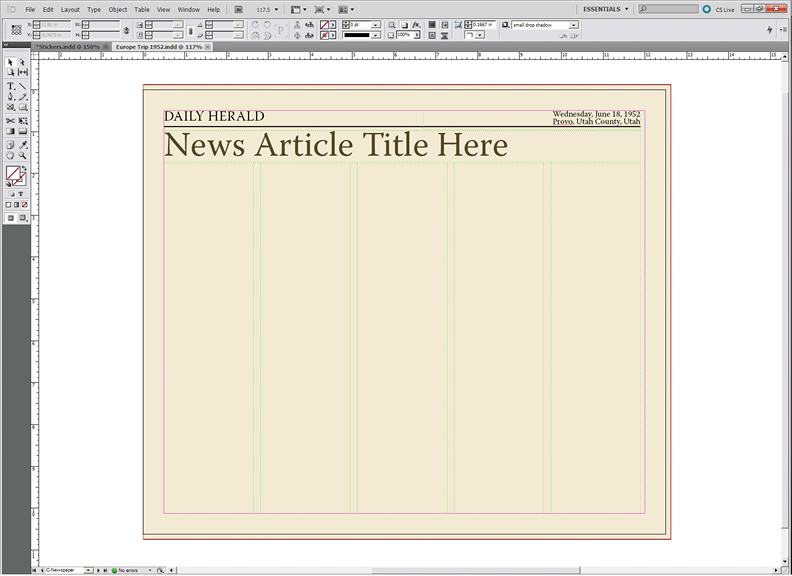 If you’ve not used an Adobe InDesign template before it is very easy. Just open the template as you would any document and then you can add pages and drag the desired master page for chapter headings and newspaper articles. You can customize it anyway you would like. If you want to edit the original template than you should make sure you open the original file. Think of the template as a starting place. 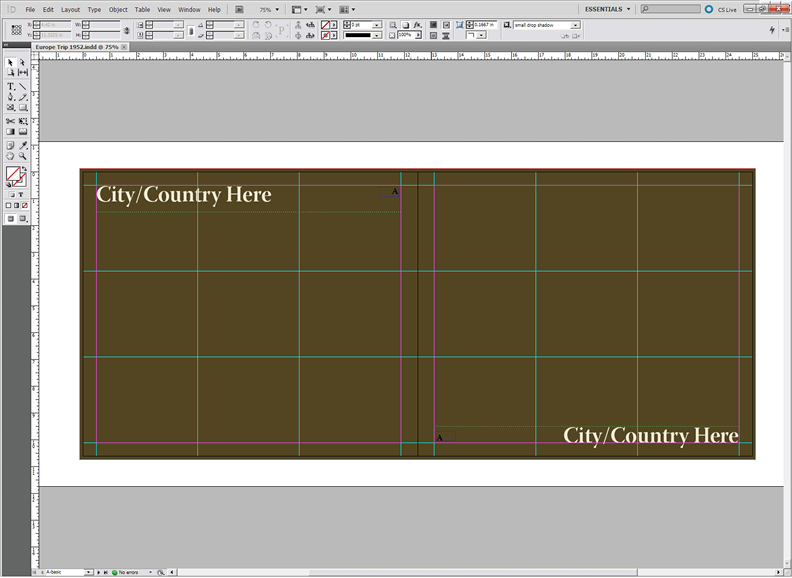 This template is sized for a large landscape book on Blurb.com. To publish your finished book on blurb, download the pdf presets and export. Then upload the pdf to blurb and order you finished book. The cover template is for an image wrap book with 440 pages. So if your book is shorter you will need to make adjustments. 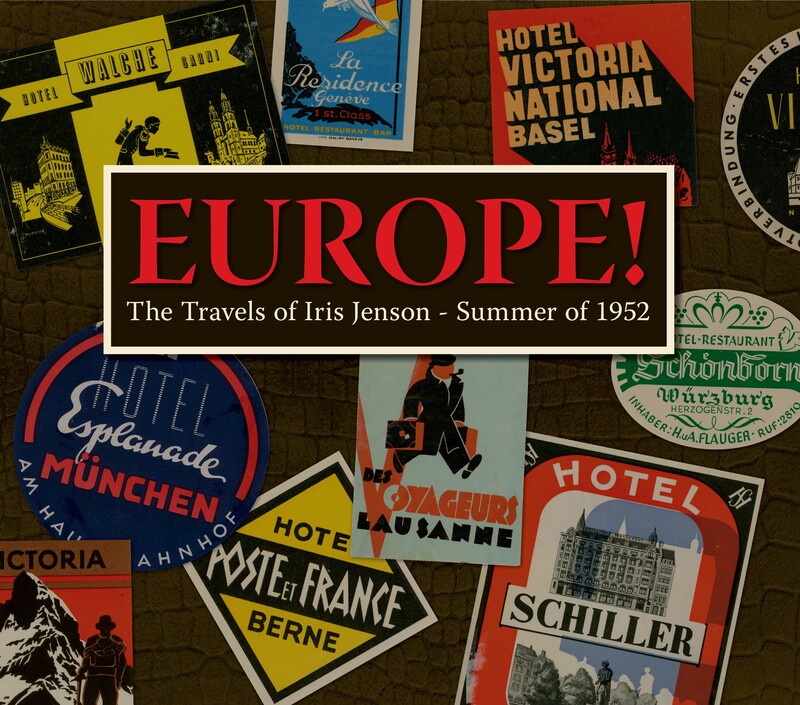 This post concludes my Europe 1952 project. If you have questions that I haven’t covered let me know and I’ll do what I can to answer them, possible with an extra post. It has been a fun journey over the last few months. How I dealt with the above items I covered in earlier posts. Follow the links above. Some where scanned and others were transcribed and reformatted to fit the page. I scanned these and cropped them to size before placing them in the document. Some of the postcards and tickets stubs had interesting edges that I didn’t want to crop off. So after scanning I opened them in Adobe Photoshop, deleted the background so that it was transparent. Then when placed in the document the deckled or torn edges were preserved. Since these items were thicker I wanted to keep the dimension. So I also opened these images in Adobe Photoshop and deleted the background to make it transparent. I really like how you can tell they are books and not just a single sheet of paper. It was fun to have the medallion that my mom got from visiting the Pope. This same process works great for objects of any shape. When placing the memorabilia on the page it is usually good to gather them near each other on the page and not spread them out across the page. Overlapping another piece of memorabilia or a photo can also help. The overlapping visually connects the items together and brings some order to a layout that might otherwise get too busy. I’ve always loved passport stamps and dreamed of having a passport full of interesting stamps. So I wanted to find a way to include all the stamps from my mother’s passport into the book about her trip. But just scanning the pages and including them that way seemed like an ugly solution. After some thought I decided to figure out a way to include just the image of the stamp on each chapter heading page. 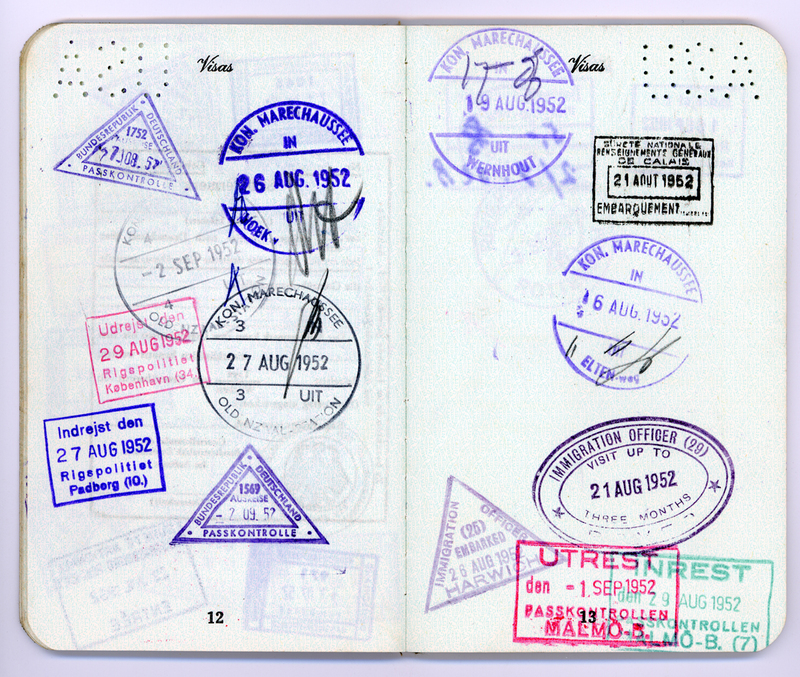 After scanning the pages of her passport I cropped each stamp into a separate image from the rest on the page. 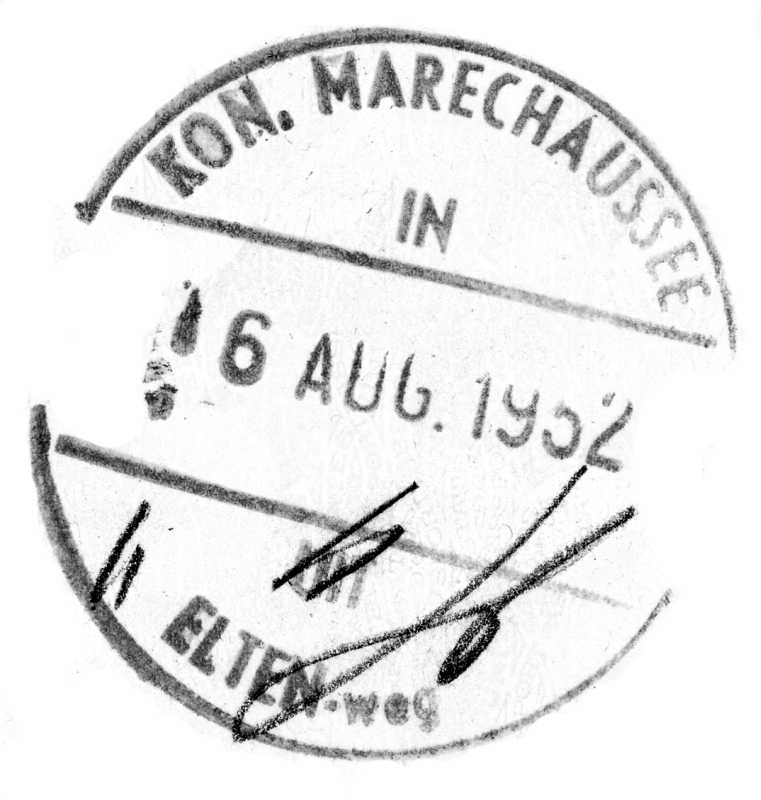 Some of the stamps overlap which just gave me more stuff that I erased from the image. All of these work was done in Adobe Photoshop. Now I started playing around with a way to separate the inked image from the background. With a simple white background it is easy to use the magic wand tool to select and then remove the background. But as you can see passport paper isn’t plain. The tool that helped the most was the background eraser tool. I hadn’t used this before so it was good to learn about it. But I still ended up doing some clean-up by hand. The last step I did was to make the image black and white before I placed it on the chapter heading page. To give it more of the effect of being stamped on the page I changed the transparency to multiply. There is probably a better way to clean-up these images but I got it done and I was happy with the effect. I like having the passport stamps for each country on that country’s chapter heading page. 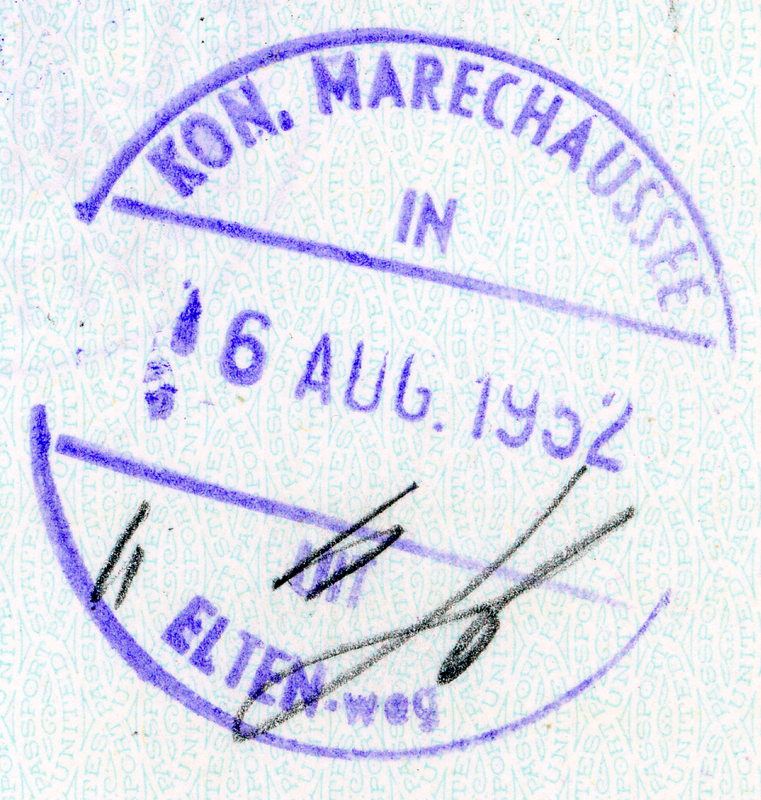 What ways have you found to include things like passport stamps in your projects? 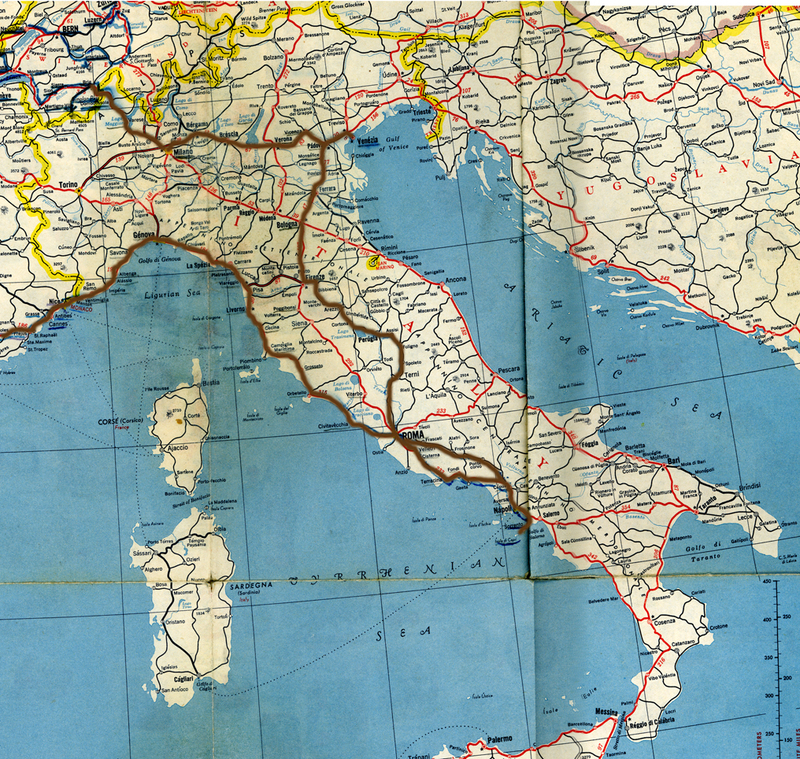 Among the many items that my mom saved from her trip to Europe in 1952 was a large map. I decided I wanted to use it at the beginning of each chapter. The map was challenging to scan because it was so big. So I scanned sections of it and then used Adobe Photoshop‘s photomerge to stitch together the section of the map for each country. If you’ve never used photomerge it is a very handy tool for doing things like panorama shots. 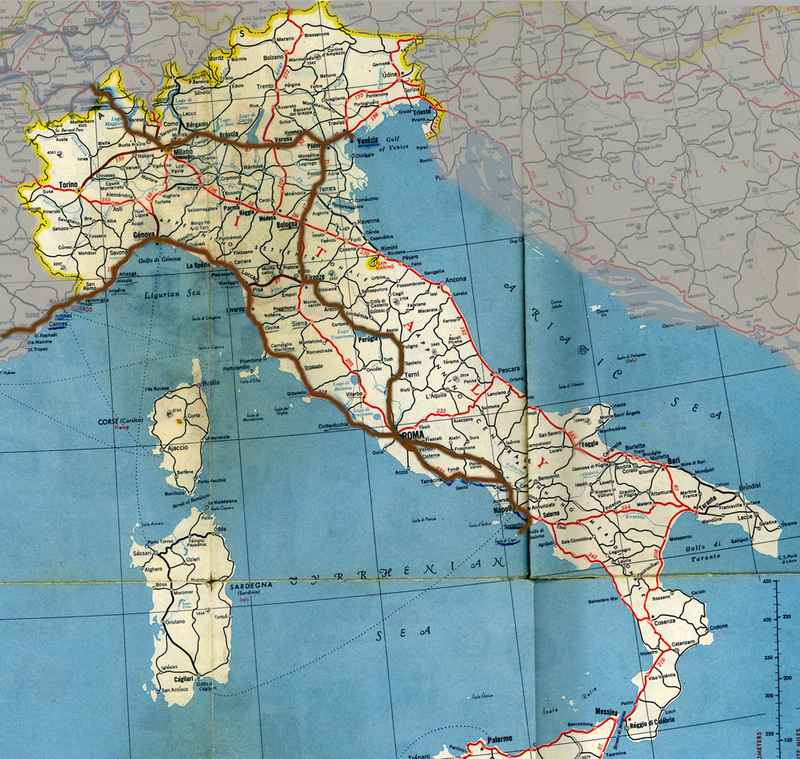 After I had a map section for each country I added a brown route line to mark the roads they traveled in that country. I did this also in Photoshop using the brush tool. To bring more focus to the country I added a grey mask that partially block out the neighboring countries, by adjusting the transparency of this layer. Once I brought the map image into Adobe InDesign, I added text boxes to label the cities they stayed in along with other relevant information and arrows to make it easier to tell the location of the city on the map. Arrows are easy to make in InDesign, just go to the stroke palette and select the style of arrow point you would like for the beginning or end of the line you made with the pen tool. I think the maps were effective in communicating a lot of the information at the beginning of each chapter in a visual way. How have you used maps in your projects? One of the wonderful resources I had for putting together this book for my mom was bunch of newspaper articles written by one of her fellow travelers on the trip. 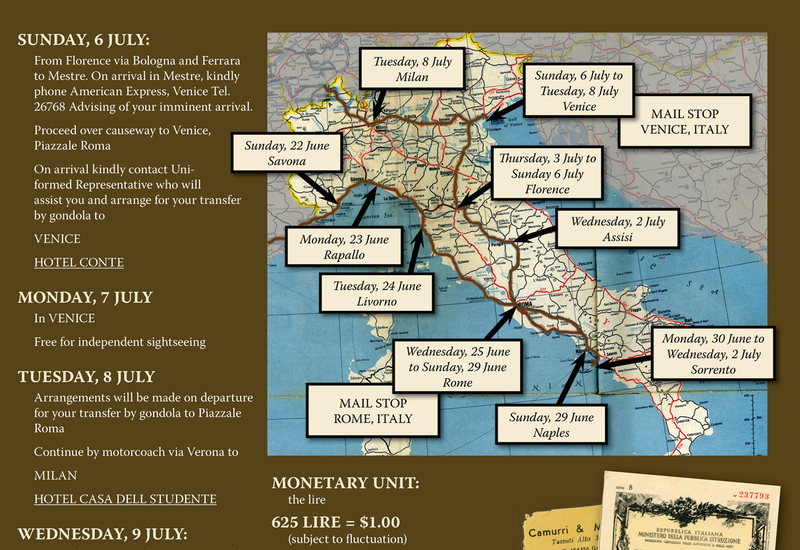 I wanted to include them because they had good information on what the trip was like, plus another perspective on Europe in 1952. But scanning in the articles and including them that way was problematic. First they were visually messy. They were different sizes and shapes and cut out from the paper in different way. Also some of them I just had a bad copy of the article and not the original. The next problem with going the scanned route was making them big enough on the page to be readable. After some thought I decided to try to replicated the look of the newspaper but to redo them so they fit into the book in a seamless way. The drawback was getting the text from the articles into my computer. I’ve never figured out how to do OCR so I had to type them in. It took awhile but I think it was worth it. After I got the articles typed the next step was to create a master page for the newspaper articles. My basic master page has a dark brown background but that doesn’t look like a newspaper. So I changed the background to a nice cream color (I used the same color as the large text titles on each page). I changed the text to black and I went from three columns of text to five so that it would have the narrow column look of a newspaper. I added a header to duplicate the look of a newspaper and a large headline style for the title of each article. Then we I came to the spot in the book where each newspaper article belonged it was a fairly simple task to change the master page and paste into the page the title and text. Then there were just a few little tweaks for the article and it was ready to go. I was very happy with the solution and I will keep it in mind for use in future projects. 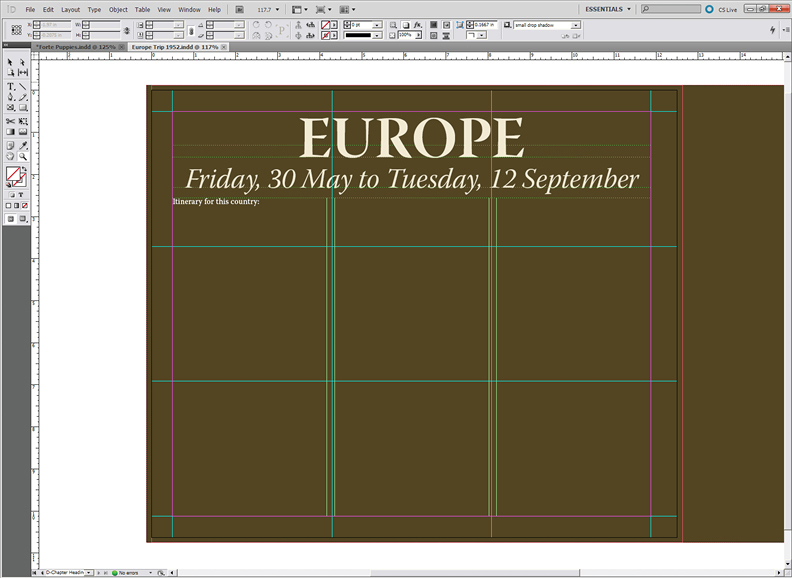 When figuring out the way you want to layout the pages of a book I like to use a grid as the structure for the design. Before & After‘s has a two-part video that talks about using a grid in your design. If you want to learn more about grids in your designs it is well worth the 10 minutes or so it will take to watch them. I especially like part 2. Because of the large size of the pages of this book (about 13″x11″) I wanted to have the text in columns. If a line of text gets too long in relation to the size of the letters it gets harder to read because it is so easy to lose your place on the line. Having columns of text solves this problem. I decided on three columns so I put guides on my master page for three columns. I also put guides horizontally to divide the page in three sections with in the margins. Instead of a small header or footer I chose to put a large title on each page. Part of the reason for this was that my mom, who the book is for, has macular degeneration plus cataracts so she couldn’t see well. Before I finished the project she had cataract surgery which helped her vision a lot. I thought that she would at least be able to read the title on each page and see something of the largest photos even if she couldn’t read all the text. It is important to keep in mind who you expect to read your stories and make decisions that will help them to be drawn into your book. If you haven’t used master pages you are missing a great time saver. In InDesign it is a simple as clicking on the master page in the pages pallet. By default there is a blank master page there called A-Master. Also by default this master page is applied to you whole document. When you add anything or edit anything on this page it is added to your entire document. Don’t worry, you can override this by dragging the [None] page in the pages pallet to any pages you don’t want to have the A-Master applied. I created two other master pages, one for the beginning of chapters and another for newspaper articles. I’ll talk about those in more detail in another post. The advantage that having the three by three grid gave me was that it helped to make it simpler to figure out the layout for each page of the book. I had lots of photos and most of those photos are either one, two or three columns wide. Some are full bleed and a few go across to the facing page. But I still used those grid lines to help me to decide how large those photos were. Here are some examples pages. The left hand page shows a “three column” photo and the right page is a full bleed. 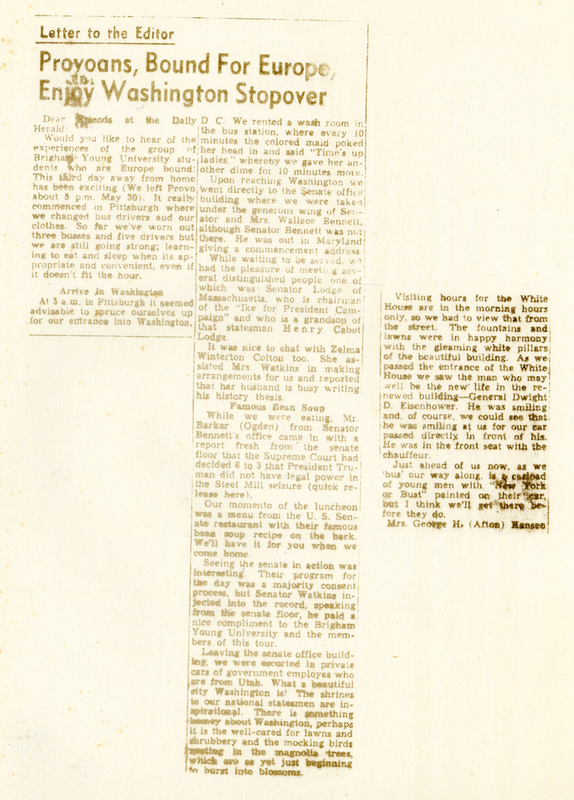 This page has a bleed on three sides with a small “one column” photo overlapping on the left, while the right had page has two “two column” photos. Here I have a “four column” full bleed and a couple of “one column” plus. When I was overlapping photos like here I was willing to allow photos to be wider than their column. So how did I decide what size to make each photo? The first criteria was appeal of the image including the quality of the exposure. Because I wanted the photos to be the focus, if the image justified it I would make it as big as I could. Next I had to take into account how many photos or other memorabilia and the amount of text. Sometimes it is very tricky to get it to all coordinate together. But having the grid makes this easier and unifies the look of the book. If you have any questions about how to do any of this please let me know. Next week I’ll cover how I handled the many newspaper articles I had for the book.